A fire in a housing block in a southern district of the Chinese capital, Beijing, has killed 19 people and injured eight others, reports say. It took firefighters several hours to bring the overnight blaze under control. The cause is not yet known. However, Beijing police say they have detained a number of suspects. The blaze broke out in Daxing district, an area mostly inhabited by migrant workers from the inner provinces who often require cheaper accommodation. The area where the fire began also hosts several small clothing factories. It took more than 30 fire engines containing 14 firefighting teams more than three hours to extinguish the fire. Some of those trapped inside the building are now being treated in hospital, the fire department said. The fire comes amid rising tension in Beijing over a beautification campaign implemented by the authorities in the city centre intended to close unsightly market stalls. Rights campaigners say the drive has included the forced removal of migrant workers further from the city centre. 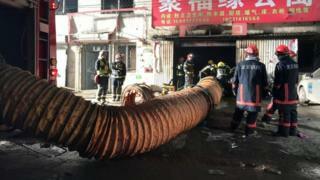 Deadly fires are routine in China, where safety regulations are often flouted and enforcement rules regularly ignored.